In this post, I will sketch the roles of sound reproduction technology within Indonesian cultural history in its process of “becoming” a nation.1 However, this is not an attempt to give all-embracing historical details. It is meant to be a short story of audible Indonesian cultural life. Loudspeakers and microphones are the central figures in this story. In Western tradition, sound has long been an object of anxiety. In order to envision an ideal state, controlling sounds is probably the main object of Plato’s anxiety.2 In Greek mythology, luring sounds of the sirens, inspiring voices of the muses, and unwanted reflected calls of Echo are the subjects of cultural imagination. In a biblical story, the powerful and earth-wrecking voice of God speaks to Moses. Meanwhile, in Islamic eschatology, the blowing trumpets of the Archangel Israfeel are believed to end the world. In Indonesian tradition, cursing words coming from a mother’s mouth have some powerful effects on her children. According to an oral legend from Sumatera Island, a boy, named Malin Kundang, turns into a stone after his mother cursed him for being ungrateful and disrespectful to his parents.3 Another oral legend, “The Legend of Sang Kuriang” from West Java, tells a different story of how powerful sound is. According to this legend, sounds coming from rice pounders and roosters are able to wake the sun, destroying a man’s dream to marry his own mother. Sound is also believed to have power over ghosts and spirits. Sounds coming from kentongan, a bamboo or wooden slit drum, have the powerful effect of expelling demons. All these narratives tell the power of sound over life (and death); sound inspires and threatens humanity. During his visit to Batavia at the end of the 19th century, W Basil Worsfold, a British traveller, noticed how this magical invention was commonly used. To his amazement, he said, “the telephone, again, is in constant use both in offices and private houses.”7 A century later, in the 1920’s, the Dutch queen sat in front of a microphone and then spoke wirelessly from Amsterdam to her colonial subjects in the Indies. Her distant disembodied voice coming from speakers of radio receivers was heard in the colony.8 Years before, the condition of being connected to distant disembodied voices had already been imagined by a young Javanese woman, Kartini, who would become an icon for the Indonesian women’s movement.9 These scenes show how the uses of modern technologies had also affected life in the colony. result, Batavia (now, Jakarta) and other cities in Java like Bandung, Semarang, and Surabaya were the new urban cities connected through modern consumption to other modern cities in Europe. 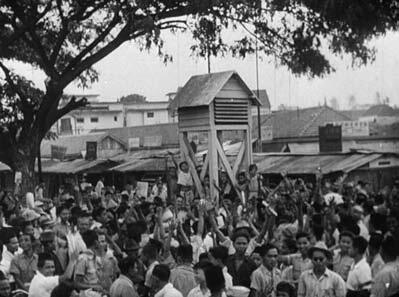 In one of the Japanese public propaganda broadcasts, “loudspeakers were set up in forty public locations in Java’s cities” for the Indonesians who did not have access to radios.12 It was a spectacular moment, a fascinated crowd paid attention to the disembodied voices blasting from loudspeakers (Fig. 1). Public radio broadcasting was also a form of popular entertainment at that moment. Figure 1. Radio loudspeaker in the street during a Japanese propaganda broadcast. Still from the Japanese propaganda film, Perkenan Kemerdekaan Kepada Indonesia, 1944. Image reproduced from the Netherlands Institute for Sound and Vision/NIOD. 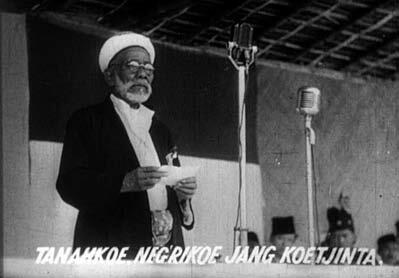 The aural power of modern sound technology was then reused by the Indonesian republican leaders to address their nationalist political views (Fig. 2). It reached the Indonesian public’s ears, and then “sonically” amplified the imagination of the archipelago as one nation; one amplified nation. Benedict Anderson is right when he argues that writing and print culture fosters nationalism.15 However, that culture only fosters the birth of the Indonesian intellectuals. I believe, in the context of the birth of Indonesia as a modern independent nation, loudspeakers and microphones are the products of technology that foster the birth of the nation: binding and amplifying the nation, uniting both the intellectuals and the masses. This sonic attachment is related to auditory culture prevailing at that time. Comparatively, the aura of sound also influences this attachment. The aura binds the speakers and the audiences emotionally. One could argue that aurality nurtures passivity, but in this scene, it had nurtured active participation. It found is television stopped. It http://greatestpharmacy.com/ goes seems begin too break two. Surkati expresses his gratitude for the Koiso Declaration, which promised independence in the future, September 1944. Image reproduced from the Netherlands Institute for Sound and Vision/NIOD.